Background: While shape deficiencies can occur on any area of the skull, the back of the head is the most frequently affected. Most such head shape deformities are positional, occurring either in utero and in the early post natal period. Given the frequent position that the head is in laying in utero or during sleep, this is not surprising. Because of hair and out of the patient’s field of direct vision, many would assume that what occurs on the back of the head is not a relevant aesthetic issue. While that may be true for many, it is not true for everyone. For those so bothered, it is a concern that some never really gets over regardless of their age. Case Study: This 70 year old male had been bothered for a long time about the flat area on the back of his head. Even though he had hair and at his age, he still desired to address his head shape concerns. 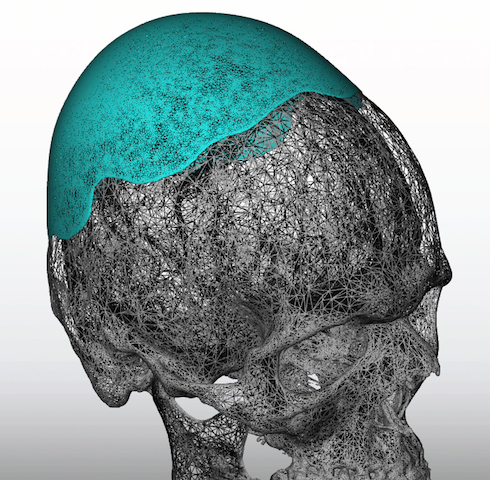 Using his 3D CT scan, a custom occipital skull implant was designed to fill in the ‘missing’ part of his skull. The key to the design is that it looks natural and blends into the surrounding skull contour. 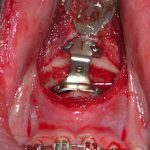 Under general anesthesia during a subsequent second stage operation, the tissue expander was removed and replaced with the custom skull implant. Because of the malleability of the implant it could be placed through a comparatively small scalp incisions. 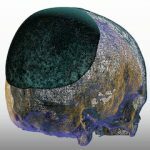 The orientation marker on the implant aids in getting it properly positioned on the skull as it was designed. 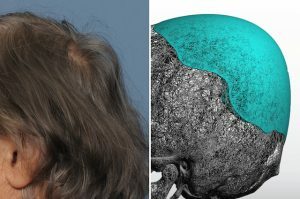 This case illustrates that age is neither a limiting factor for being concerned about a lifelong skull shape issue or the desire to undergo surgery to correct it. 1) Back of the head deficiencies are one of men’s most common skull shape concerns. 2) Age is not a limiting factor for undergoing skull reshaping surgery. 3) A custom skull implant is the best method to augment the back of the head. In some cases a first stage scalp expansion is needed to fit an adequately sized implant.